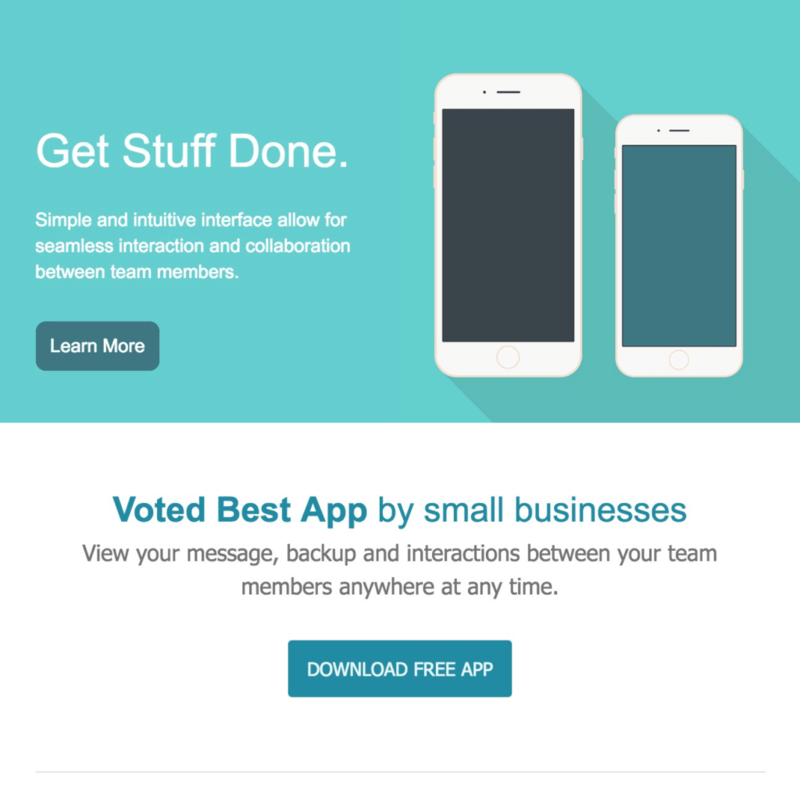 ActiveCampaign is the new kid on the block. 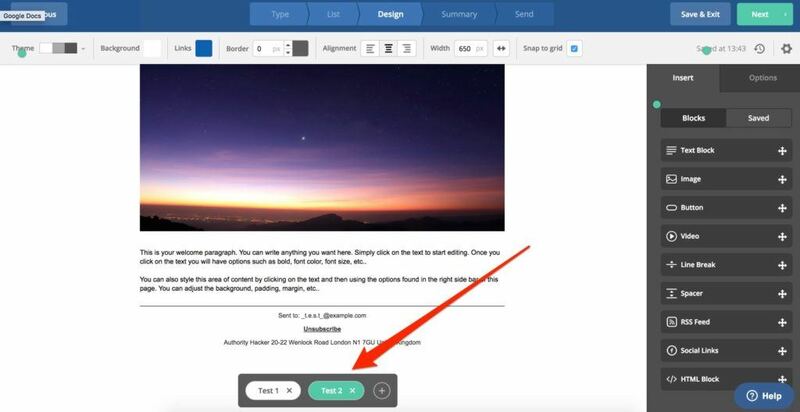 Very robust email automation features, even if they are a little cumbersome to use. Good value for what you get, even on the Lite plan. No options for a free account, however. Not terribly complicated but it is a bit sluggish with a moderate learning curve. Numerous support channels, detailed documentation and knowledgeable support staff. 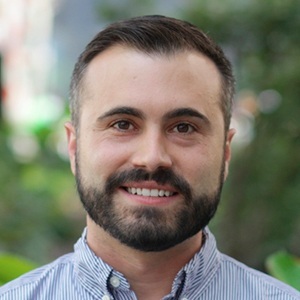 From it’s humble beginnings as a Chicago startup back in 2003, ActiveCampaign offers an affordable way for business owners to stay in touch with their contacts. 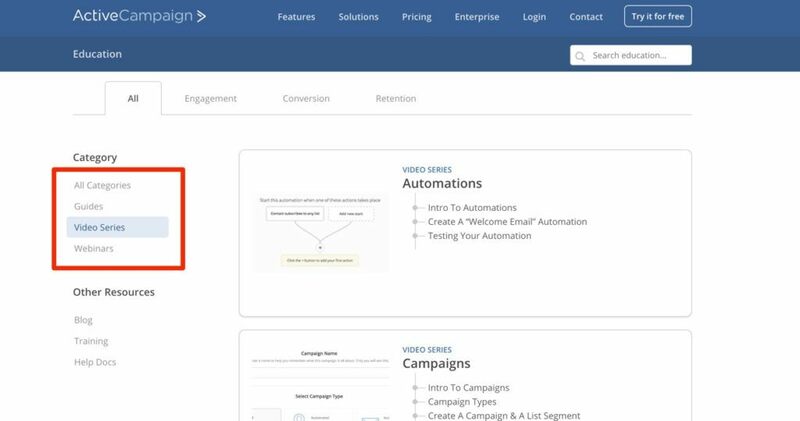 Today, it’s a full-blown, intelligence-driven email marketing platform and sales CRM platform that revolves heavily around automation — ultimately giving users more power over their email marketing, with less work. 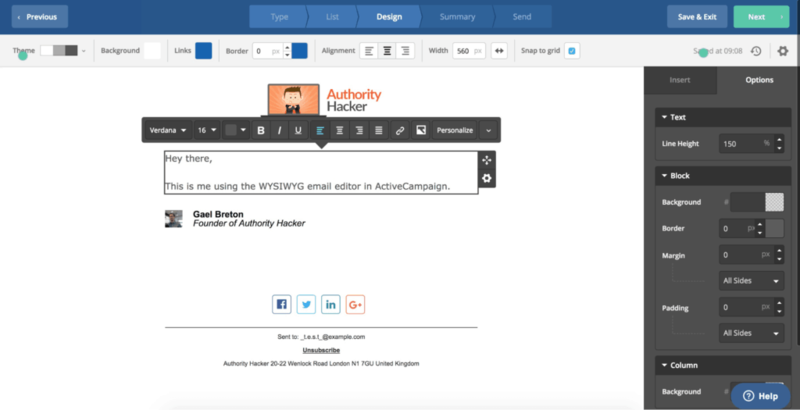 The company has become one of the biggest email marketing platforms on the market, and it’s also one that we — the Authority Hacker team — use on a daily basis. For this review, I fired up ActiveCampaign to see how it performs as a standalone tool, and in comparison to popular alternatives. As I mentioned above, this is one tool that has been part of our arsenal for some time, which makes this review different in the sense that I’m much more aware of the nuances — both good and bad. Regardless, I’ll do my best to give the most objective review of this software in terms of where it is today. 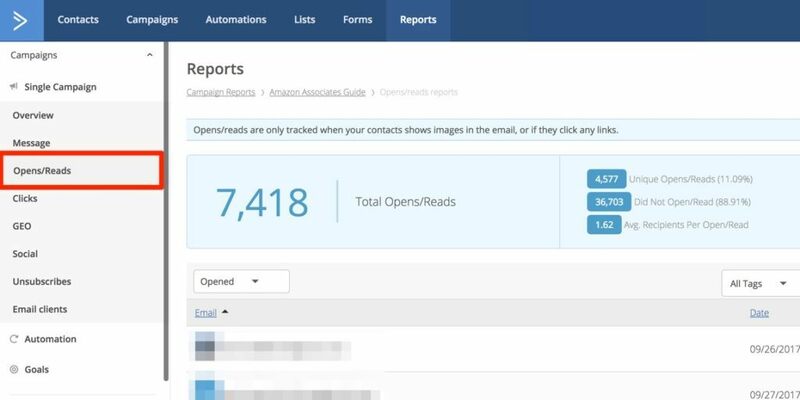 If you want a more in-depth breakdown of the process I used to review ActiveCampaign, I suggest you check out my email marketing tools roundup. ActiveCampaign offers the best of both worlds in terms of list segmentation, as it utilizes both lists and tags. Personally, I like this approach because you, the user, can choose how you want to manage your subscribers — whether that’s using multiple lists, or a single list with multiple tags. 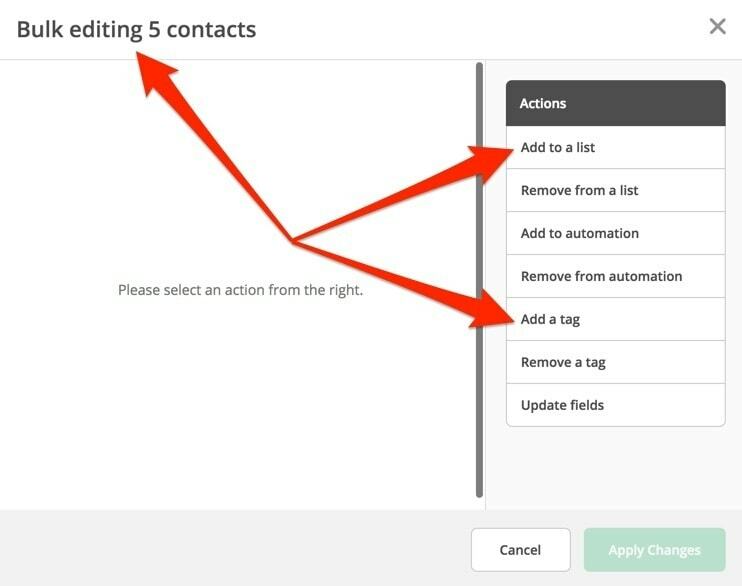 You can do all this manually, and in bulk, either from the contacts menu or the lists menu. er mattis, pulvinar dapibus leo. That said, to really take advantage of what ActiveCampaign can do, you’ll definitely want to be using tags, or more specifically, automated (or behavioural) tagging. 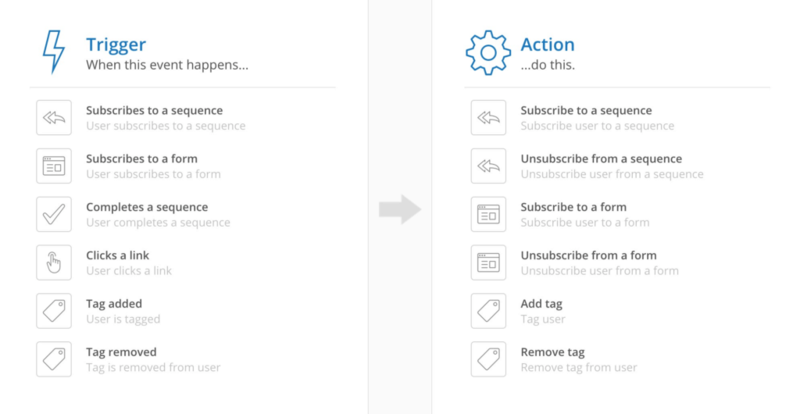 Using automation workflows, you can set up conditions that will tag your subscribers based on various actions they take. 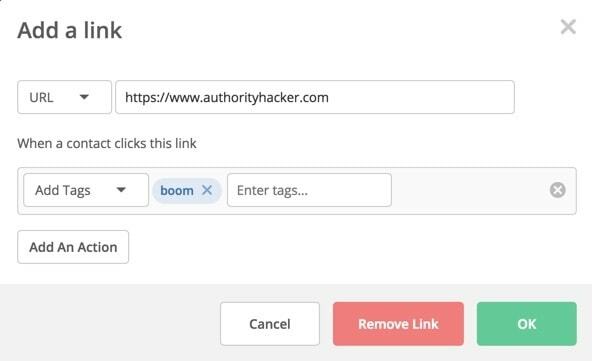 A basic example I’ve been using a lot in this series is applying a tag to subscribers who click a specific link in an email. 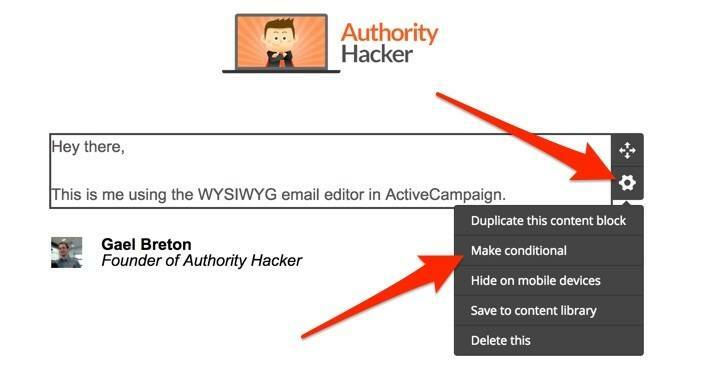 Doing this in ActiveCampaign couldn’t be easier, and you don’t even need to leave the email editor. The real magic, however, comes when you combine ActiveCampaign’s tagging system with their site-tracking feature, which allows you to tag subscribers based on their interactions with your website. The more you know about a person’s interests, the more specific you can get with your marketing — and this email marketing tool provides countless ways to leverage that information. Everything considered, there is one downside to ActiveCampaign in terms of subscriber management, in that it offers so much flexibility it can be easy for things to spiral out of control if you don’t keep a tab on things. …well, you better change this habit when you start using ActiveCampaign, or you’ll be wishing you did. The management aspect could be a bit overwhelming for noobs, but you really do get the best of both worlds here with lists and advanced tagging. If ActiveCampaign was a Bugatti Veyron, the 1,000 horsepower engine would sit firmly under the ‘automation’ tab. This what makes this tool. It’s the primary reason we use it for all our email marketing on Authority Hacker and Health Ambition — both sites that are able to rake in a comfortable 6-figures per year. 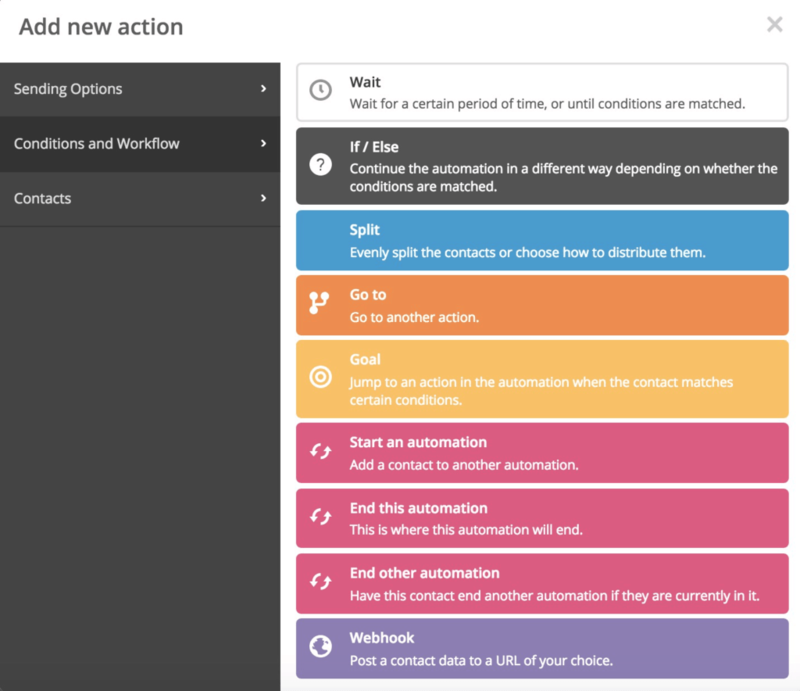 Like Drip and GetResponse, ActiveCampaign uses a visual workflow builder to create automations. You’ve seen some basic example above, but these things can also get pretty meaty with some creativity. This is excellent for building complex automations with conditional logic, because you can branch out into different segments and do all sorts of crazy stuff with your contacts. ActiveCampaign calls these ‘Actions’, and just like Drip, you have plenty to choose from. When you combine these actions with intelligent tagging and site tracking, the possibilities are almost infinite in terms of what you can achieve with marketing automation. 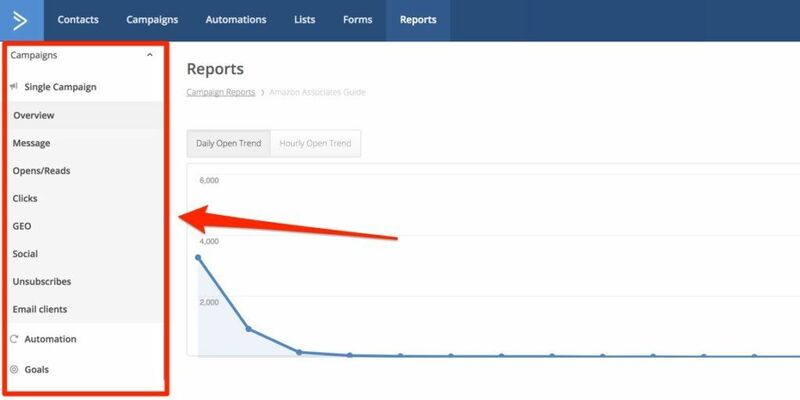 If you want some ideas on how site tracking can be used to put your automations on steroids, I recommend giving this article a read. That’s not to say ActiveCampaign doesn’t come with it’s quirks. It definitely does. For one, the visual builder can be pretty slow and clunky (but not always, Gael sent me a screencast where everything is fast and smooth for him). Adding a new email to your workflow, for example, takes you out of the builder and into a completely different area of the tool — making what is an otherwise simple action frustratingly slow. We’re continuously tweaking things with the platform to improve speed. Unfortunately, it’s not as simple as flipping a switch or improving our servers or something like that. But, we’re always optimizing and making slow and steady improvements. It may not be a night and day difference, but the platform should feel faster today than it did 6 months ago, for example. Personally, I haven’t seen any noticeable speed increase since I started using the tool over a year ago, but that doesn’t mean I don’t believe improvements have been made. It also isn’t helped by the fact that you have to use an advanced builder for every automation, including really basic ones. An alternate, faster and leaner automations builder is something that both Drip and ConvertKit offer which I’d like to see implemented. Of course, if you can see past the inefficiencies of actually building out automations, you’ll be blown away by what ActiveCampaign can do here. Seriously, I’ve been using this thing for over a year now and I still find new things I didn’t know it could do. There are few better options on the market when it comes to the raw power and flexibility of ActiveCampaign’s email marketing automation features. I just wish the workflow builder was faster to navigate. There are two ways to run split-tests within ActiveCampaign. The first is more of a traditional approach, in that you select the option as part of setting up a new email campaign. As you progress through the setup process, you’ll be asked which type of split-test you want to run. The first option works as you’d expect, as in you’ll have to fill in two subject lines instead of one. If you choose the second option as shown above, you’ll essentially be given two different email templates to work on. This allows you to test as few or as many different variables as you want, and ActiveCampaign will divide your list in order to test which one performs the best. What I love about this is, you can determine a winner either after the campaign has run, or during. As you can see, ActiveCampaign gives you a LOT of control over how the test should play out, including how the winner is determined and the exact ratio to use. If used correctly, this feature alone can be worth hundreds, if not thousands of extra dollars in revenue for your business. But, as I mentioned earlier, there’s also another way to leverage split-tests with ActiveCampaign. 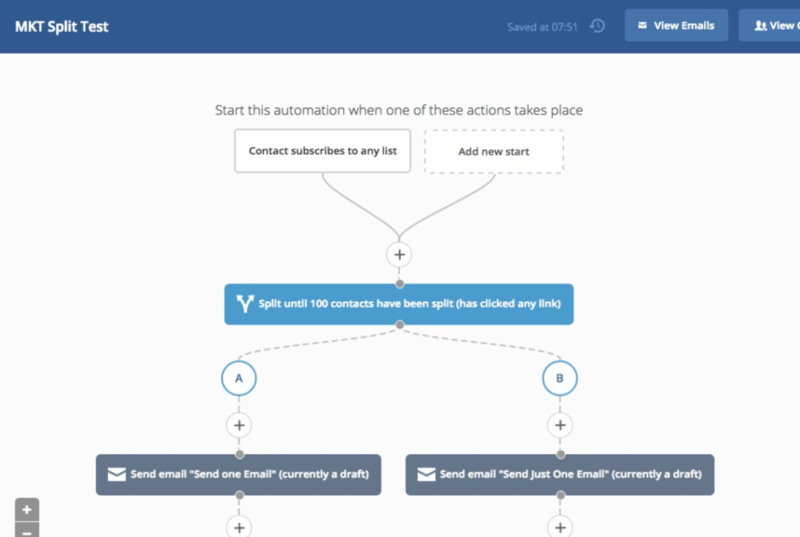 Instead of testing emails against each other, you can split-test an entire automation workflow. 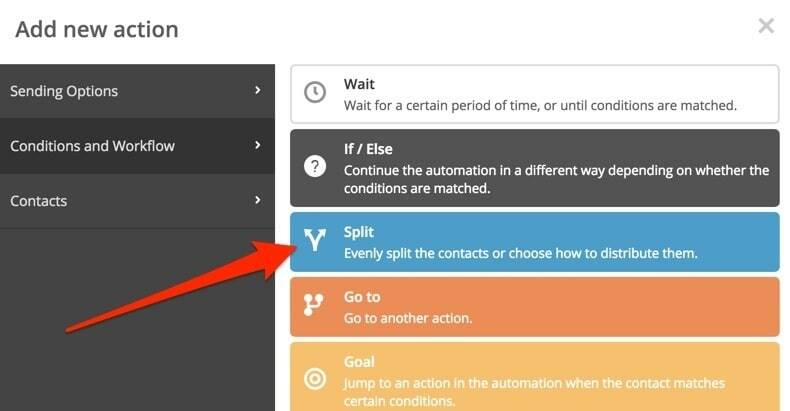 All you need to do is add a single action at the start of your automation, called “Split”. You can then determine how you’d like to split your contacts, and whether you want a winner to be determined. The best part about all this? 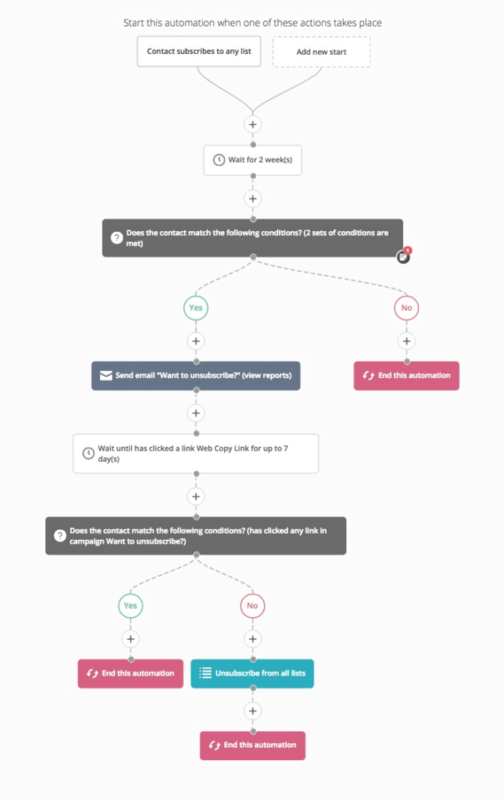 ActiveCampaign holds nothing back when it comes to selecting the conditions of these tests — meaning you can crown a winner based on dozens of different criteria. I’d be lying if I said I’ve used this area of the tool to anywhere near it’s full capacity. It’s still a rabbit hole of discovery in many ways. One thing’s for sure though — this alone can be HUGE for your bottom line if used strategically and effectively. I honestly cannot fault ActiveCampaign when it comes to split-testing functionality. They’ve got it all covered. 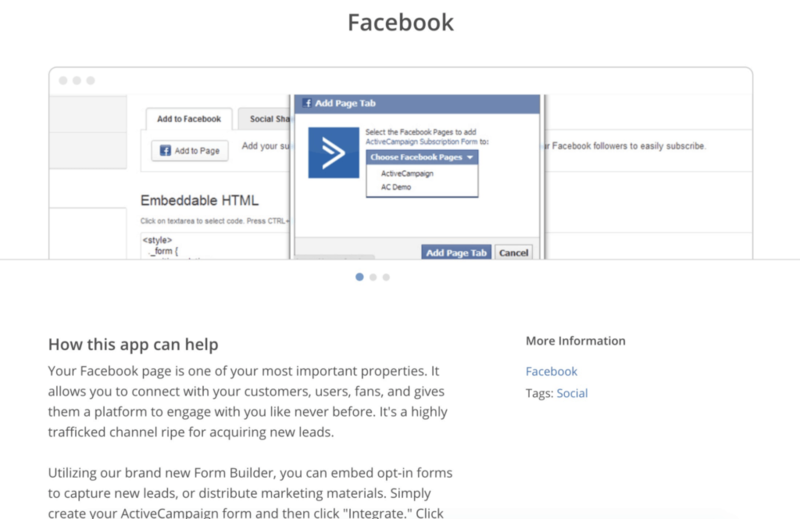 Like most email marketing tools, ActiveCampaign does have it’s own form builder. The problem, however, is that you can only build an “inline” form unless you’re on the more expensive plans. And when I say more expensive, I mean more than double the price to go from the “Lite” plan to the “Plus” plan. Ultimately, if you really want the ability to create different types of forms, you’ll have to pay significantly more for the privilege. Keep in mind, Authority Hacker has a list of around 60k subscribers and we still haven’t felt the need to upgrade. That certainly won’t change for additional form styles. 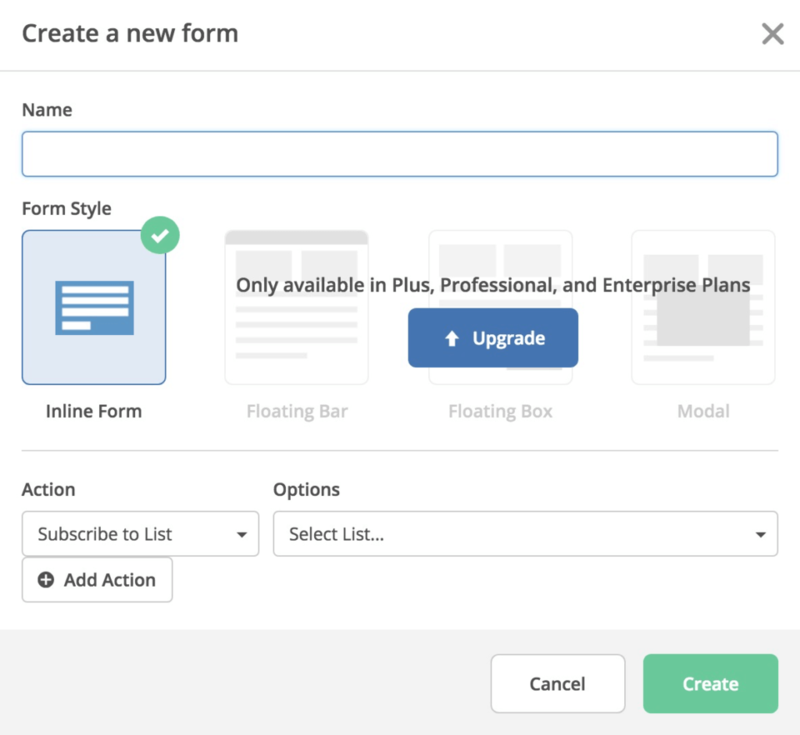 So what about the form builder? As you can see, it’s pretty straightforward and feels congruent with their email builder (which I’ll get to shortly). 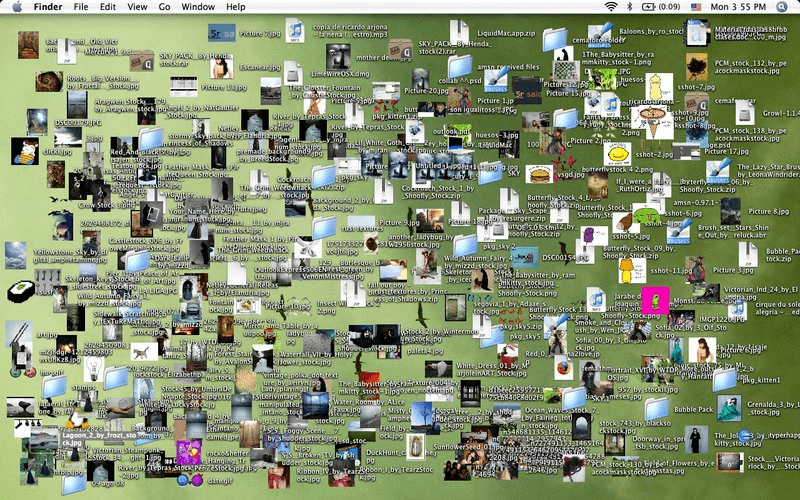 In terms of design flexibility, well… there isn’t much of it here. For example, clicking on a field only gives a handful of options, none of which are able to change the actual design of the field itself. 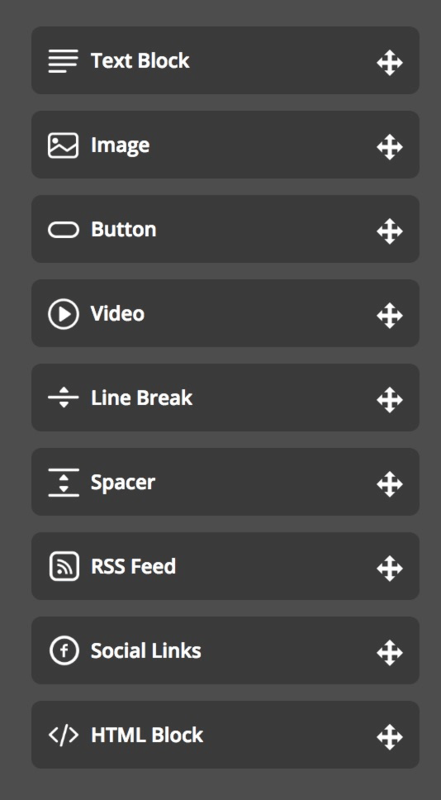 ActiveCampaign does partly redeem itself with the inclusion of a CSS editor, though you will of course need some basic understanding of CSS to be able to use this. One thing that immediately stood out to me though, was the branding at the bottom of the form — “Marketing by ActiveCampaign”. Not only are you limited to inline forms on the Lite plan, but you cannot remove this branding. Personally, this is a deal-breaker for me when it comes to using ActiveCampaign for forms. 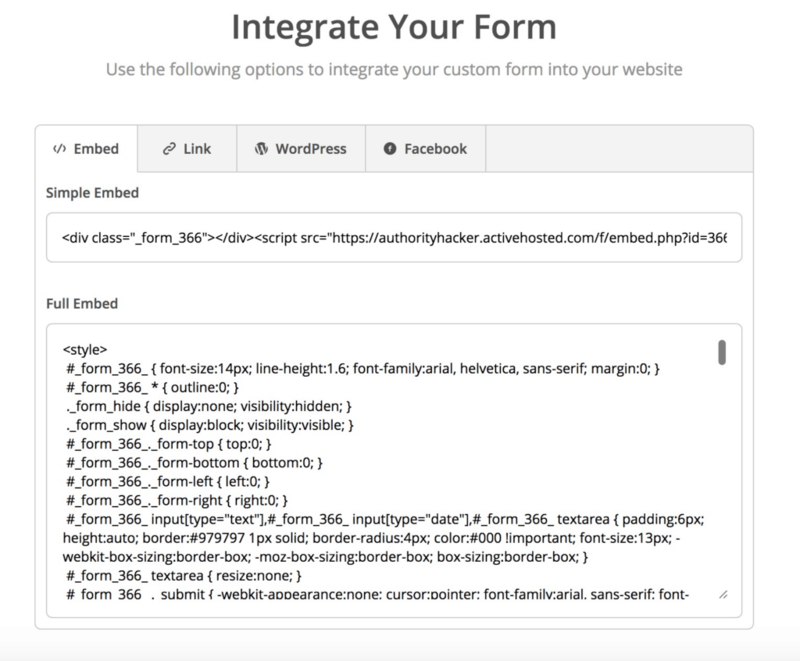 Finally, let’s talk about actually implementing the form, and this tool gives you several options. A fair number of options there, making it what I would say is the strongest aspect of ActiveCampaign form builder. Unless you’re willing to shell out the big bucks to get access to more form types and remove branding, ActiveCampaign isn’t the best option. Email templates are one area where email marketing tools seem to differ the most. 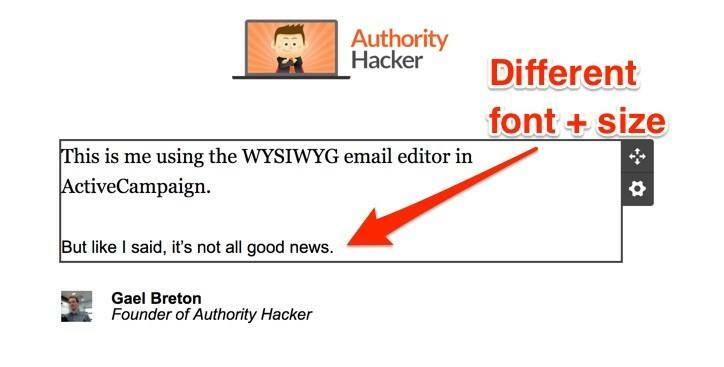 Whether it’s a poor selection of templates, outdated designs, or a hard-to-use email editor, there always seems to be something not quite right. 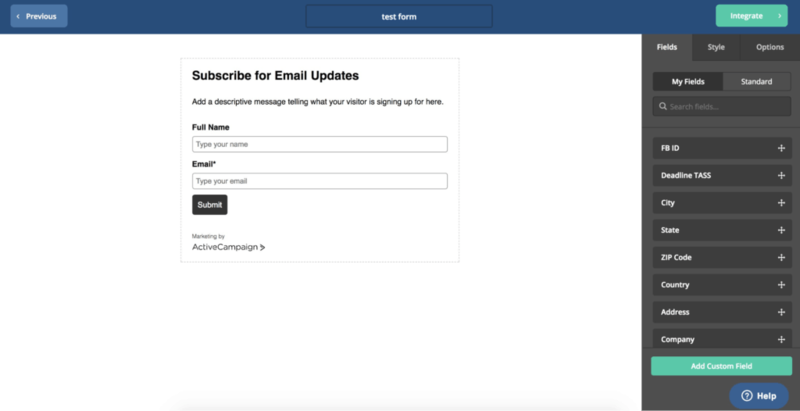 Let’s start with ActiveCampaign’s pre-designed email templates. What you see above makes up the bulk of the library, with only around 30 templates to choose from. 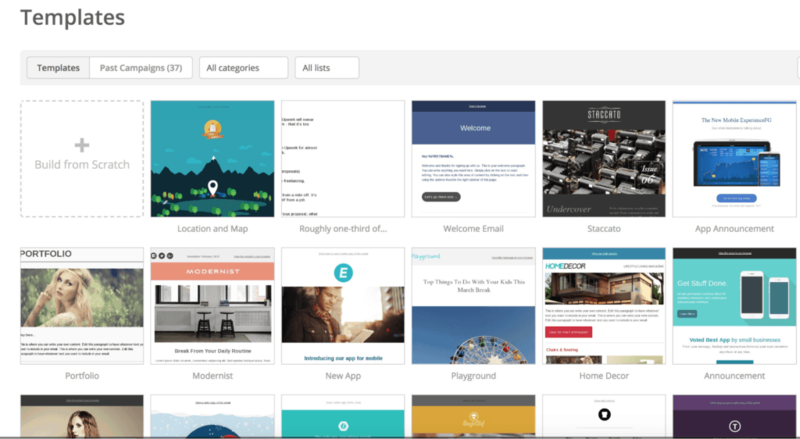 While they do cover different types and industries, it’s a far cry from the sheer number of templates you get with other tools, such as MailChimp. Not off to the best start, but what about the design? Of course, you can start from scratch if that’s your preference, and this is the route I usually prefer to take. ActiveCampaign has what I feel is one of the better email builders on the market, though it doesn’t come without problems. 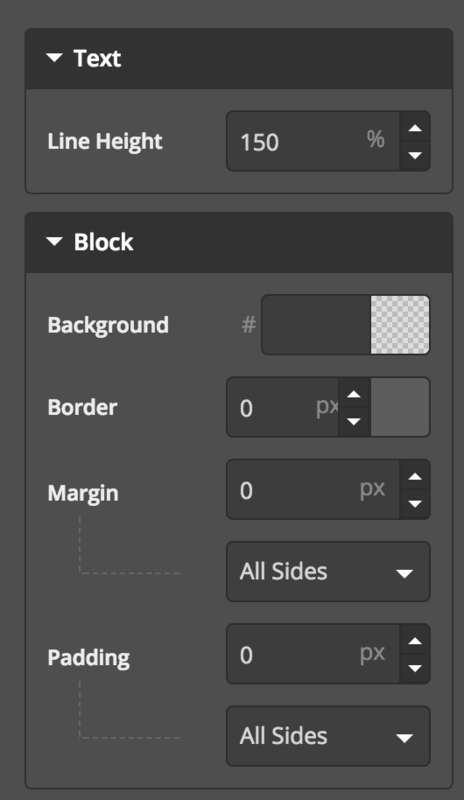 As I said, it feels a lot like the form editor but with WAY more options in terms the elements available and the design flexibility. 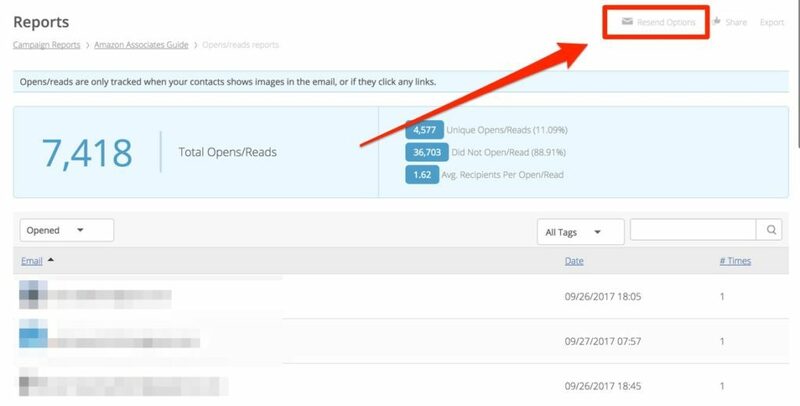 But aside from that, there are also some cool things you can do to show email content based on specific criteria. These are called conditional blocks, and you can enable this through the little cog icon next to any block. This allows you to adapt your email content to the specific interests of your subscribers based on the tags associated with them. But like I said, it’s not all good news. One of the biggest issues with this editor is pasting in text, whether from a notepad, Google Doc or anywhere else, ActiveCampaign doesn’t always stay consistent with existing formatting. When this does happen, it’s just a case of selecting all the text and changing the formatting again, but it’s certainly something that gets old, real quick. Not only does it take 3x longer than it should to upload, but it doesn’t even show at the top of the pile, so you have to dig through potentially hundreds of images to find it. For me, these are just minor annoyances that I’ve learned to live with, but it’s worth noting either way. 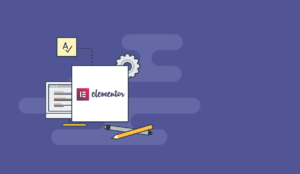 If you’re looking for a large selection of modern templates, this isn’t it, but if you’re looking for a capable automation marketing tool with a decent email builder, you’ll get by just fine with ActiveCampaign. It’s fair to say that ActiveCampaign is established itself in the market, and with that naturally comes a strong library of integrations. In this case, we’re looking at over 150 integrations, including all the usual suspects such as WordPress, Stripe and Shopify. What I like about this particular library is the documentation. Clicking on any of these apps gives you a breakdown of how the integration works. 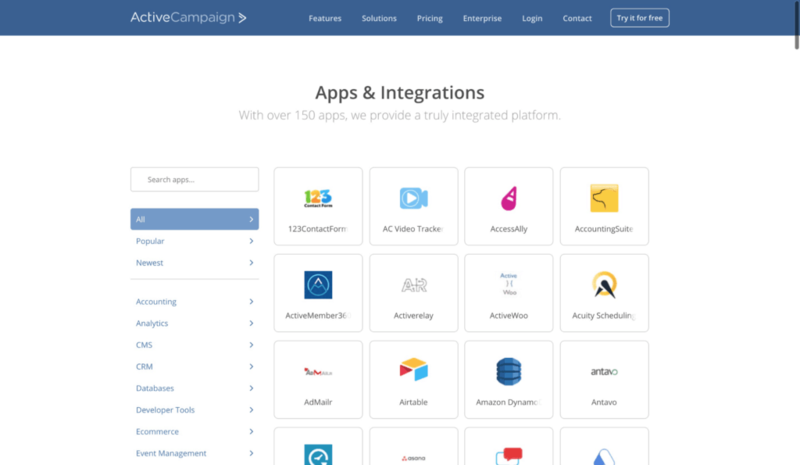 I should also mention that ActiveCampaign’s closest competitor, Drip, only supports a fraction of these applications. And even though this tool doesn’t quite stand up the likes of MailChimp in the integrations department, you’ll almost certainly find everything you need here. 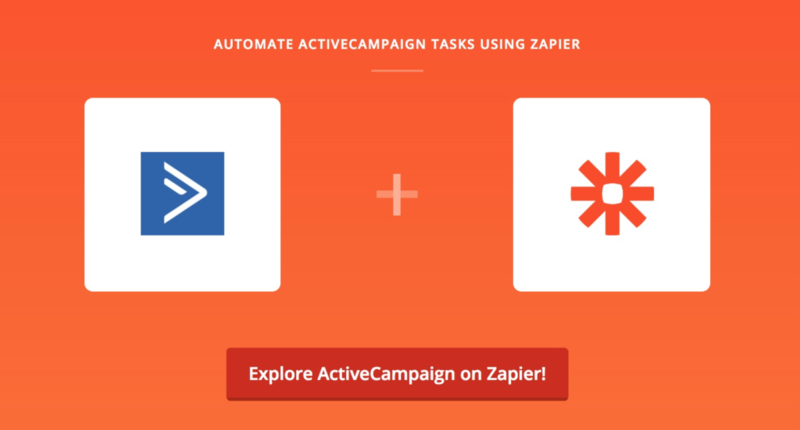 If not, you probably won’t be surprised to know that ActiveCampaign is integrated with Zapier, so that’s always an option if all else fails. ActiveCampaign is one the most heavily supported email marketing tools when it comes to third party applications, so you’ll be hard pushed to run into any trouble. Of course, it’s always best to check the complete list of integrations before making a purchase on any tool. Better safe than sorry. 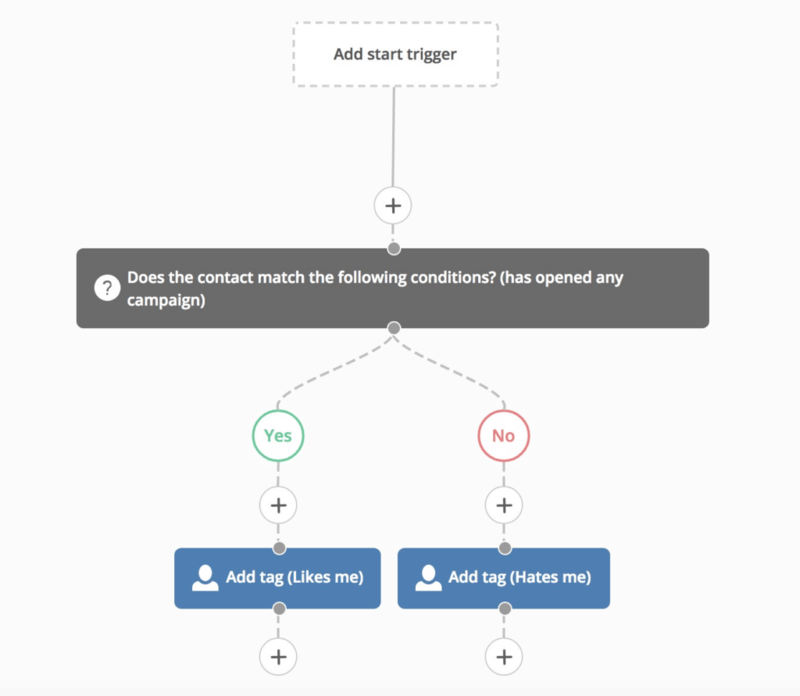 Tracking your campaigns works similar to most email marketing tools, in that you configure these options right before sending. ActiveCampaign does offer several more options than the usual open and link tracking. These include ‘Reply Tracking’, which allows you run separate automations based on replies, and ‘Google Analytics’, which allows you to get deeper insights on your campaigns. Another thing to consider is ‘Site Tracking’, which allows you to do some really crazy stuff with your marketing automation — something I covered earlier in this review. 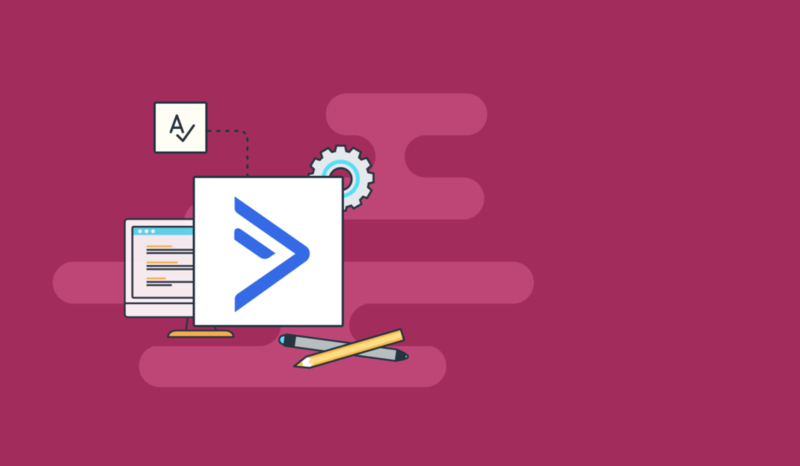 Setting this up only takes a minute (following this guide) and is well worth doing if you plan on taking full advantage of ActiveCampaign’s automation features. So, all that’s easy enough, but what about the reporting side? You’ll be pleased to know, ActiveCampaign goes all out on the statistics for each individual campaign. Clicking into any of these reports will give you a much deeper breakdown of how it played it out. What’s particularly nice about these reports is that you can actually drill down into the relevant contacts. You can even run a new campaign based on these contacts, such as resending the campaign to those who didn’t open. It’s not the most intuitive interface, but I guess that can be said for ActiveCampaign as a whole. Personally, Drip is just as thorough with reporting but does a MUCH nicer job at laying it all out. I think the word I’m looking for is “digestible”. Yeah, yeah it is. There’s also the loading aspect. ActiveCampaign can sometimes takes it’s time to load up a report, but again, slowness is generally something you have to accept as part of using this tool. ActiveCampaign offers one the best tracking and reporting environments among email marketing tools, but it is in need of a serious speed injection. Like any tool these days, the knowledge base is where you’re likely to find the answer to most of your questions. 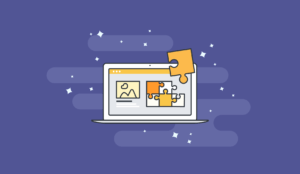 ActiveCampaign has a comprehensive knowledge base, including how-to articles, videos and webinars covering virtually every aspect of the platform. Of course, as you’d expect, you can reach out via email to get a more personalized answer to your question. I fired off a test email and I got a response back within 24 hours. I’d say that’s pretty reasonable. If for some reason this doesn’t suffice, you can also contact them by phone and live chat for a more immediate response. I’ve used the live chat a few times and have always found if reliable, though you won’t always get through to someone immediately. These days, Facebook groups have become an awesome source of support from existing users, whether official or unofficial. 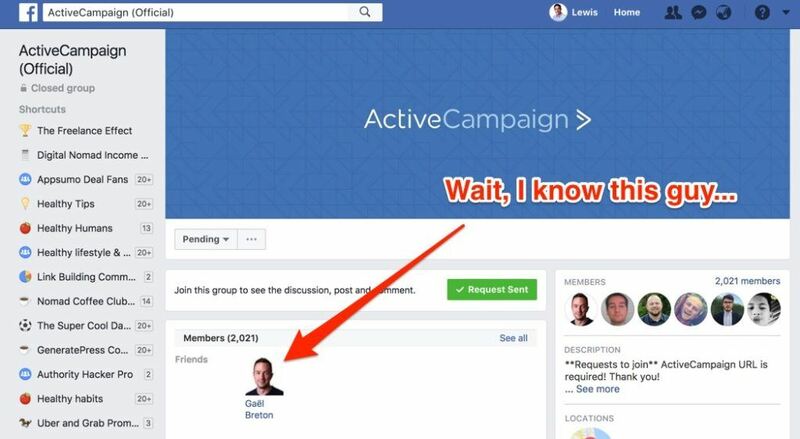 So, I did what any sane reviewer would do, I scoured Facebook in hopes of an active, ActiveCampaign group. Would you believe it, I found not one, but TWO groups. Both of these are pretty active, with multiple posts per day and plenty of comments on each. 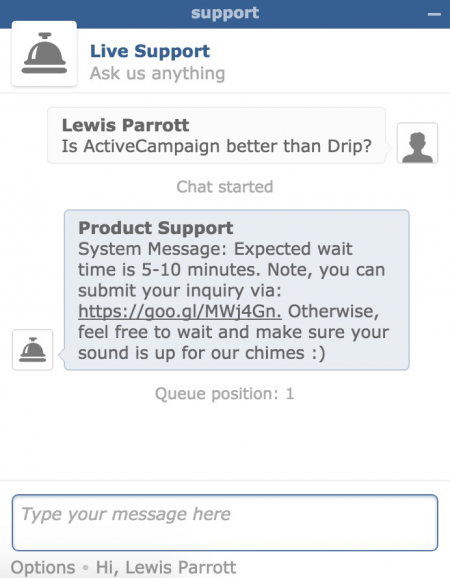 Plenty of support channels available and the quality of response from ActiveCampaign was more than satisfactory. The live chat and Facebook groups are the cherry on top. From our own testing, ActiveCampaign achieved an open rate of 34.6% in the given time frame. To give you a better picture of how this stacks up, I put a table together that showcases and compares the results across all tools in this series. Note: Aweber is missing some results because they repeatedly refused my import of the GlockApps seed list, meaning I was unable to run the test. Very frustrating to say the least. 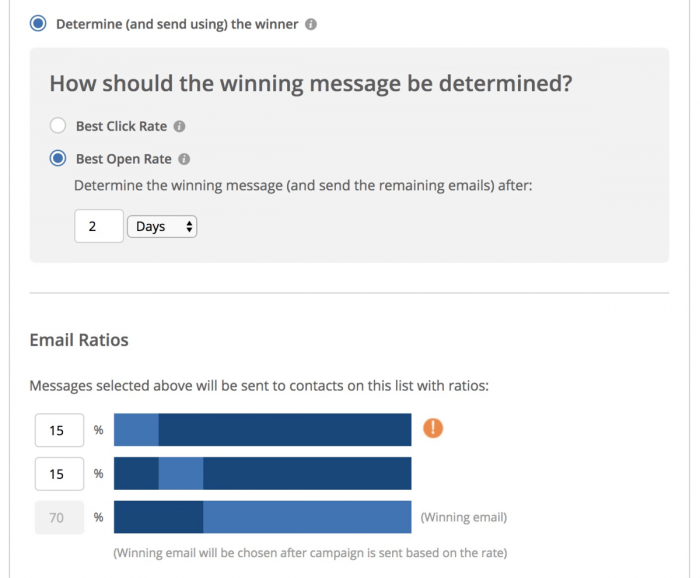 We knew that accurately and fairly testing deliverability across 7 email marketing tools was going to be a challenge — and it turned out to be one of the most frustrating tests I’ve ever ran in my life. Fortunately, Brian Gladu from ActiveCampaign was kind enough to comment on the results of our test. Deliverability is extremely difficult to test accurately. There are so many factors involved that can’t be controlled. GlockApps also have a very high margin of error because you are testing with seed accounts, not real users’ inboxes, and this can lead to very strange results. These seed tests can be helpful, but they should be taken with a big grain of salt. You would have to do hundreds of them to get a solid average, and even then you could see misleading results, mainly with Gmail who will treat these seed test inboxes much different than real users. While I do believe these results give a fair indication of deliverability expectations from each platform, I also agree with Brian that it’s not bulletproof by any means. Now that I’ve covered all the different features and functions of ActiveCampaign, weighing up the pros and cons and giving my experience along the way — let’s talk about YOU. As with any tool, ActiveCampaign isn’t going to be the right choice for everyone, so I’d like to get to the bottom of who exactly this email marketing tool is suitable for. If you’re looking for email marketing on a budget, ActiveCampaign is an absolute steal for what you get. As you can see, ActiveCampaign currently comes in at about mid-level in terms of pricing. Before the recent price increase, I would have no doubt recommended ActiveCampaign for those on a budget. Honestly, it was an absolute steal starting at $19/month. Now, even though it’s still very fairly priced when you consider how capable of a tool it is, I can no longer class it as a ‘budget-friendly’ email marketing tool. The truth is, if you’re really starting out on a budget, then you’re probably better off with tools like Drip and MailChimp, which both offer generous free plans. 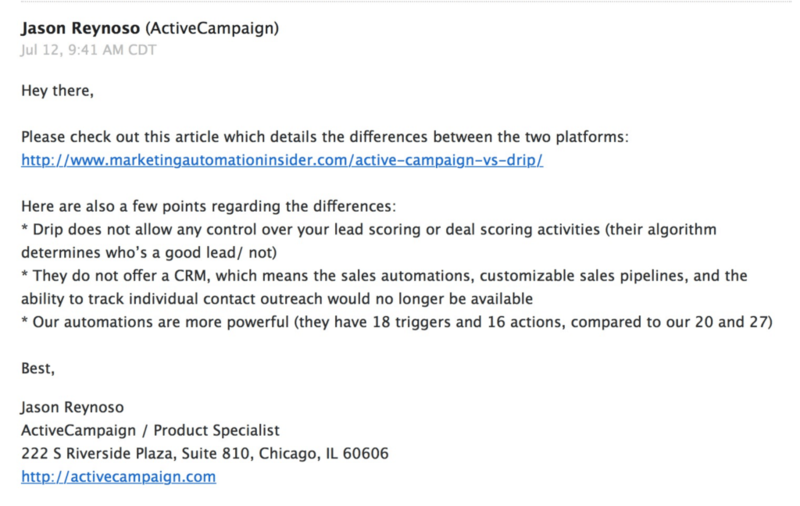 I’ve mentioned this a few times throughout the review, but ActiveCampaign is far from an intuitive email marketing tool. And I’d even say it can be quite complicated at times. Basically, it has all the qualities that make this a horrible platform for the average beginner, but still very worthwhile for someone with a bit more experience. Could you still use this as a beginner if you really wanted to? I’d say you could, yeah. The great thing about ActiveCampaign is that it’s so affordable, you can even justify using it at a basic level until you gain the confidence to dive into the more advanced stuff. That said, if you’re looking for something that mimics a lot of what ActiveCampaign does, but is infinitely easier to use, I’d highly recommend you check out ConvertKit. So you see yourself as an email-marketing tycoon? Well, if you’ve read this far, you won’t be surprised when I say ActiveCampaign is an all-out email marketing powerhouse. Not only does it have one of the most capable automation tools on the market, but it can do everything (and in some cases more) than what other, more expensive tools cost. 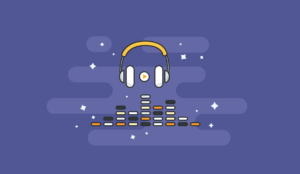 For example, Drip is a popular alternative to ActiveCampaign, and it’s considerably faster while doing most of the same stuff — but it also costs about 50% more on average. It’s also worth noting that despite being almost 5,000 words in length, I haven’t even covered every aspect of ActiveCampaign. 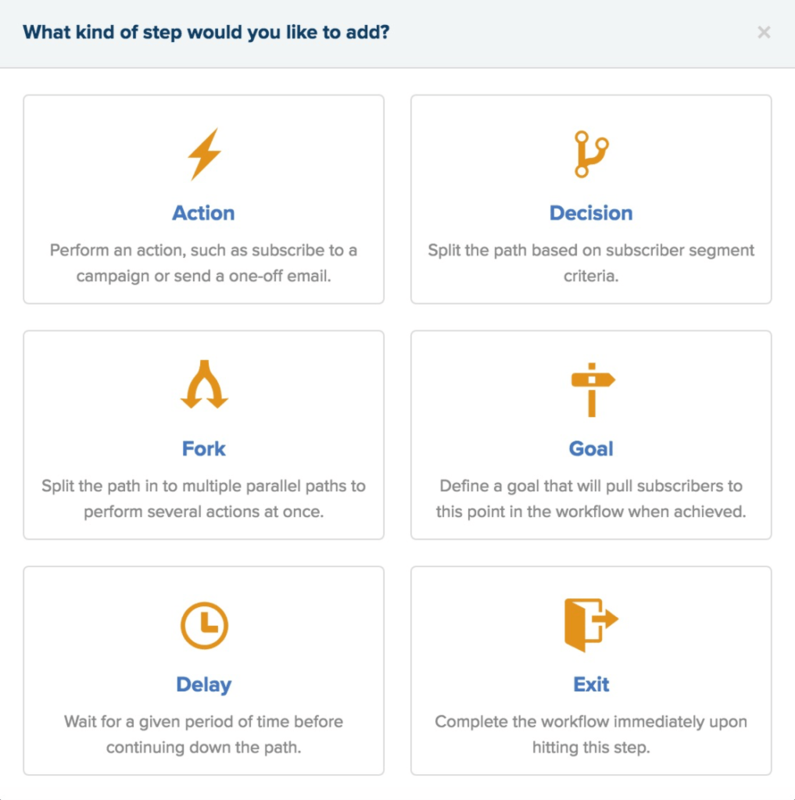 Deals CRM: Create custom deal pipelines where leads move through various stages of your sales process, all the while taking advantage of ActiveCampaign’s automations features to help you move, update, and prioritize your deals. Event tracking: Unlike ‘Site Tracking’, which I’ve already covered, ‘Event Tracking’ tracking allows you to leverage ActiveCampaign in combination with things like video views, button clicks, orders, log-ins, and in-app behavior. Attribution: Attribution let’s you see what traffic sources were the most valuable in terms of achieving a specific conversion, so you can start to hone on what’s working for your business. As you can see, it’s a lot more than just an email marketing tool. For me, the slight edge that ActiveCampaign has in terms of functionality—as well as being more affordable—makes it the better choice. For you, that may not the be case, but we’re lucky enough to have stellar options for whatever side of the fence you happen to be on. If moolah isn’t a factor and you value raw speed and efficiency above all, get Drip. Otherwise, if you’re looking for a high-level email marketing tool at a fraction of the cost and you can overlook the quirks, get ActiveCampaign. As someone who’s been using ActiveCampaign for over a year now, I can honestly say that even after reviewing 7 of the most popular email marketing tools, I’ll be staying right where I am for now. While some will love the flexibility and speed of Drip, or the freemium features of MailChimp, or the raw simplicity ConvertKit… ActiveCampaign seems to be the most consistent across the board. If you’d like to see how it compared to the other tools in this series, you can click here to get a full breakdown. That’s all from me, but if you’re thinking about giving it a try, and I highly recommend you do, you can click here to get a free, 14-day trial of ActiveCampaign. ActiveCampaign is good, but it can be overwhelming for noobs for sure! My biggest gripe is the form builder, which is useless for mobile optimisation. Even their templates aren’t very mobile friendly. Do you need to use templates? Most marketers still just send text based emails.